In 1876 cabinet makers Benjamin H. Herts and his brother, Isaac, were involved in the Centennial Exposition in Philadelphia. It was a reflection of the prominence the Herts Brothers had achieved. In the years to come major clients like the New York Produce Exchange, the Columbia Bank and the fashionable St. Regis, Knickerbocker and Murray Hill Hotels would seek the services of the Herts in furnishing and decorating their new buildings. The sons of the celebrated auctioneer Henry B. Herts who dealt in European antiques and artwork, the brothers had established their furniture showroom at No. 896 Broadway, one of a row of four brick buildings owned by the Goelet family which had been acquiring Manhattan real estate for about three decades. 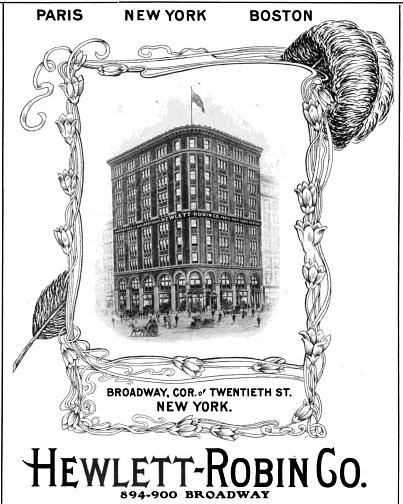 The Herts furniture factory was located on West 19th Street. In 1879, following the deaths of their father and uncle, brothers Robert and Ogden Goelet inherited the preponderance of the family property. As the stretch of Broadway between Union and Madison Squares filled with large commercial buildings in the last quarter of the century, the brothers sought to improve their properties. 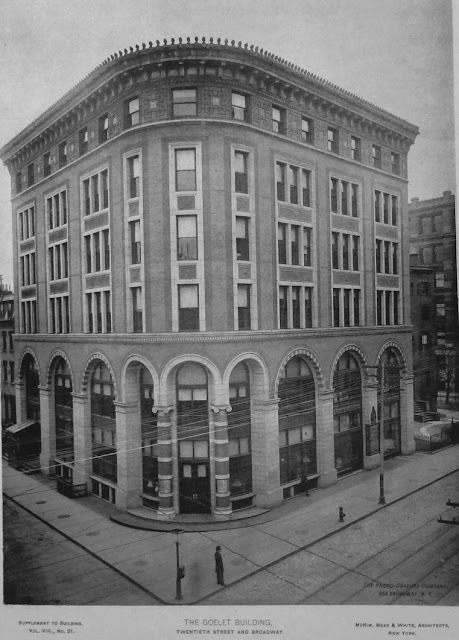 In 1886 the Goelets commissioned McKim, Mead & White to design a six-story mixed-use building on the site of the four structures at Nos. 894 to 900 Broadway. Completed a year later, the building gently curved around the 20th Street corner. A two-story arcade with variegated voussoirs provided expansive openings for the street level stores. Above, contrasting terra cotta and brick completed the colorful but restrained design. The Goelets apparently had made concessions to their celebrated furniture-making tenant when they razed No. 896; for Benjamin Herts was one the first concerns to move into the new Goelet Building. And among Herts’ first customers to visit the new showroom was Governor David B. Hill. Although Hill was unmarried, he complained that the Governor’s Mansion was too cramped. He set about expanding the house—nearly doubling its size at taxpayers’ expense. On February 23, 1888 The New York Times sarcastically reported on the expense of the remodeling. The newspaper noted that the politician ordered $4,455 worth of furniture from Herts Brothers “comprising such articles as sofas, armchairs in silk damask and plush, mirror, drapery, plush portieres, tapestry portieres, a mahogany extension table for $160, and a Turkish lounge, upholstered in tapestry, trimmed with fringes, $135.” The lounge alone would have cost approximately $3,000 today. Another interior furnishings firm, Archer & Pancoast Manufacturing Company, makers of gas fixtures and metal work, was also in the building at the time. Herts Brothers was still in the building as the 19th century turned into the 20th. By now the neighborhood had become a part of the millinery and apparel district and in 1899 the National Sewing Machine Company had its offices here. In addition to sewing machines, the firm latched onto the bicycle craze, offering the 1899 Eldredge Bicycle for $50. The company marketed less expensive bikes available from the store at $40, $30 and $25.00. Highly-polished granite columns support the soaring corner arches. In 1905 Robert Goelet leased the structure to developer Henry Corn for a period of 20 years. Corn commissioned his architect of choice, Robert Maynicke, to expand the Goelet Building upward. Maynicke removed the top floor and added four stories which he sympathetically melded with the McKim, Mead & White design. With the renovations complete, Shoninger Brothers, importers of laces and embroideries established its headquarters here, prompting the renaming of the building the Shoniger Building. The Persian Rug Manufactory had its showrooms here at the same time. The 22-year old firm made custom-woven rugs at its factory in the Bronx and outfitted clubs—The Crescent, Athletic, and Freundschaft among them—as well as armories. Custom-woven rugs were made by the company for the 22nd Regiment, 69th Regiment, 71st Regiment and the First Signal Corps. Later that year, on August 8, five men and two girls working late at the embroidery shop of Solomon & Newman on the 10th floor found themselves locked in. When a passing policeman heard their shouts from high above the street around 8:30 p.m., he stopped each passerby and asked to try his key. An hour later, an employee of the Holmes protective firm, Thomas Judge, happened along. Judge remembered that Holmes kept a key to the building and rushed off to retrieve it. Half an hour later he was back. “Then he found that the lock had been put out of order by the many experiments tried on it,” reported The Times, “and another half hour elapsed before the prisoners were liberated. Among the other apparel firms in the building at the time was Nat Potar & Co., a men’s neckwear company. Two years before Henry Corn had enlarged the building, Frank Freedman was a pupil at Public School 87. 1903 was the 250th anniversary of the founding of New York and Mayor Seth Low felt that the city’s children should understand the depth of its history. An essay contest was held and in June young Frank Freedman was awarded a medal by The New York Times as one of the four highest grades. At Roosevelt Hospital it was discovered that Frank Freedman had been killed instantly. On his watch chain was the medal awarded to him by The Times ten years earlier. The following year the Interchurch World Movement of North America rented two floors of the building. The group attempted to maintain harmonious relations among people in America’s burgeoning industrial society. The 10th Floor, where Solomon & Newman’s workers had locked themselves in 14 years earlier, was leased by Demmerle & Co., in 1920. The firm that manufactured cloth hats and caps used the 13,000 square feet for its executive offices and salesrooms. Along with Demmerle was Louis Siegbert & Brother, commission merchants and manufacturers of cotton goods; Lorimer, Greenbaum Company, “art lines,” who took the third floor; and the Storm Umbrella Company. Around this time Maynicke’s cornice which closely matched the 1886 original was scalped off the Goelet Building. Other than this highly unfortunate modernization and expected alterations to the street level, the McKim, Mead & White masterpiece survives greatly intact.